I will never forget my first audition at Coronation Street. And the first time I ‘nearly’ made it. It was with Judi Hayfield and it was 1996, and I was living as an unemployed hippie in Urmston with uni pals. I had just graduated from MMU and I’d decided, in my infinite wisdom, that the very best thing to do before this immense life changing opportunity at Granada TV was to go out boozing around the village the night before. Armed with a bottle of paracetamol, a can of coke and way too much attitude I rocked up at the old Granada Studios on Quay Street and waited for them to spot my obvious talent and determination. I couldn’t understand why I hadn’t been signed up there and then whilst sat in the reception area to be honest. I felt my talent could be seen by everyone, I believed an aura of talent engulfed me like a lingering fart, I was that egotistical I figured everyone knew I was the next big thing, and that’s why the receptionist had probably been looking at me. In fact she was probably wondering a) what I was wearing (I had come dressed as a sunflower) b) Why I stunk so much and c) Why I was talking to myself in the reflection of the windows. As a child I had worked on Wac 90 with Tommy Mallet and frankly – I thought the job was mine. I was just waiting for the rest of the world to catch on. Needless to say I didn’t get the job, I didn’t get a recall it and it took another 20 years before I got another casting at Cori. I have managed to retain some information and experience in these past 20 years and I do like to ‘pass it on’ to the younger generation of starlets. Don’t go out drinking the night before casting. You will stink, be crap and no one likes it. Quit with the ego. It’s only acting. You aren’t saving lives. Once you are over the ego then I suggest you follow these tips for a swimmingly brilliant TV career- if you don’t get the job then at least you won’t have to knock on the door for another 20 years to be let back in. THEY need to know that YOU know you stuff (even if you don’t know it). If you are just starting out then quite often it’s just going to be a few lines. There is no such thing as a small part. Just small actors. Everything I am writing below applies to every character you are likely to read for. Even if you are just buying one of Betty’s Hot Pots in’t Rovers. 1) Names. Character names are chosen very specifically. At the risk of sounding like Katie Hopkins – If you are reading for a character called Penelope and your husband is called William it’s gonna be a different kind of character than Shaza with her fella called Frank isn’t it? For the record – I would probably be cast as Frank so it’s ok for me to pass judgement and my granddad was called Frank. It’s my fave name. 2) What is your characters objective? In every conversation we have as humans – we WANT something. In the ‘acting world’ this is your objective. Keep your objective simple and direct. If its complicated, long winded and vague your acting will be vague and lack honesty and clarity. What does your character want in this scene? Work out what it is and keep it in mind at all points. 3) Just like real life – characters use every trick in the book to get what they want. I call this the characters emotional journey. What emotions does your character go through to get to their objective. This is also a good opportunity to have a look at why you have been asked to read particular scenes? 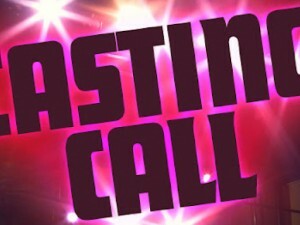 What is the casting director looking for? Quite often it’s the ability to show a characters emotional journey. 4) Re-actions Re-actions Re-actions. The single one thing that so many inexperienced actors miss. And for TV they need to be subtle, truthful but very present. Don’t keep your head in the script while the other character is talking. Listen to them, look at them and react to them. As a general rule and unless its an over lapping line or a cut off – when there is silence that’s a good indication it’s your line so that’s when you need to react and look at your script. The casting director does not want to look at the top of your head, they want to know – that when they go for a close up of your reaction, you are gonna have one, and not be staring blankly into space. Also – if you open the scene, start your first line as a reaction to what somebody has just said, if they haven’t spoken or you don’t know what they have said previously, make something up. That’s your job. It’s called pretend. If you have the 2nd line then learn that line and deliver it with a reaction before you speak instead of reading along with them in your head. 5) Use your thumb to keep track of where you are up to in the script. After you have said your line quickly scroll your thumb down to your next line. That way you can look up and react and not loose your place when it”s your turn to speak. Also have your script somewhere near your eye line but not blocking your face. That way you can stay emotionally connected to the character you are talking to and it doesn’t break every time you look down for your line. 6) Say it out loud. Nip to the loo’s, nip outside – whatever but say it out loud. You don”t want the first time you say those words out loud to be in the meeting so find a quiet corner and go for it. 7) You aren’t there to make friends. Say hello, nod nicely, but focus on what you are there to do. Some actors will freak you out with their tales of whatever amazing job they have just done, some will sap your energy with their own insecurities. Stay out of it. You don’t need to be rude but you don’t need to be bessies either. 8) Don’t do on and on about your acting to the casting director. They have your CV, they know what you can do. They want to know if you can play the character they are casting and are you gonna be ok on set with everyone else. Funny anecdotes are good but don’t turn it into a stand up routine. Like me. 9) Note for myself. If the casting director is one of the the old school theatrical lovies in that London and they do air kisses – learn to embrace the air kiss on each cheek and do not under any circumstances lick their lips with your tongue. It’s never going to endear you to them. Ever. Just accept that down south EVERYONE does air kisses and it’s just another example of the differences between us and them. 10) Finally – try and wear something that at least suggests the character you are going for? And if you get a recall go in exactly the same clothes. Even a change of colour or slight change of style can suggest something completely different. The bonus of this is also that you have a legitimate excuse for wearing dirty clothes. I know so many talented actors and they don’t work because they have terrible audition technique. Likewise I see some pretty shocking actors working – I guess they must have good audition technique or pals in high places. THAT – I can’t help you with! Pop down to a class and let us help you on the crazy road to stardom. You can’t possibly mess up any audition as spectacularly as I have? I do love an actors mentality though. I remember saying to my mate “oh well, it’s all for a reason, I am meant for something better, something else will be around the corner, just you wait, they’ll regret not having me”. 2 months later, I started work as a Butlins Redcoat. Now that’s a job that embraces an eg0!